Bertram Ramsay has acquired almost mythical status in the history of the Second World War, firstly as the principal organizer of the Dunkirk evacuation and then as naval commander of the Allied invasion of Normandy - in the eyes of many, 'the organizer of victory'. But because Ramsay was killed in January 1945 and never wrote his own memoirs, his life has until now been difficult to pin down. Andrew Gordon, prize-winning author of The Rules of the Game: Jutland and British Naval Command, writing with the help of Ramsay's descendants, now describes the career of this intense and territorial man in full, for the first time establishing his true role in the two great tests of his life and conveying his very particular personality. 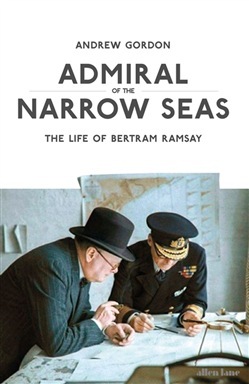 This is a superb biography of a naval officer, which also casts much new light on the military history of the first half of the twentieth century. Acquista Admiral of the Narrow Seas in Epub: dopo aver letto l’ebook Admiral of the Narrow Seas di Andrew Gordon ti invitiamo a lasciarci una Recensione qui sotto: sarà utile agli utenti che non abbiano ancora letto questo libro e che vogliano avere delle opinioni altrui. L’opinione su di un libro è molto soggettiva e per questo leggere eventuali recensioni negative non ci dovrà frenare dall’acquisto, anzi dovrà spingerci ad acquistare il libro in fretta per poter dire la nostra ed eventualmente smentire quanto commentato da altri, contribuendo ad arricchire più possibile i commenti e dare sempre più spunti di confronto al pubblico online.